In the late 80’s and early 90’s many LIUNA regions implemented training programs to further improve skills and safety of members. 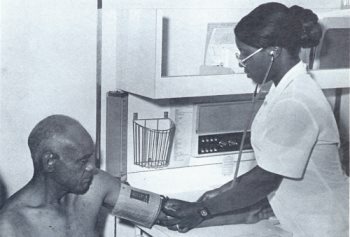 In 1981, New York LIUNA Locals added drug and alcohol rehabilitation to their welfare programs. Also in 1981, with rising awareness of the dangers of asbestos, the New England Laborers’ Training Academy (NELTA) began a pilot Train-The-Trainer program in this and by the end of 1981, trained its first 72 Laborers in asbestos removal, helping to secure asbestos removal projects for union contractors. By the middle of 1982, NELTA had trained more than 300 Laborers in the new work. 1983 marked the 100th anniversary of construction of the Brooklyn Bridge which like many of New York City's tunnels and bridges was built by members of Local 147 also known as the Sandhogs. In 1985, the Department of Labor recognized highway flaggers as part of laborers work, protected by Davis-Bacon prevailing wage provisions. In 1988, LIUNA established the Laborers' Health and Safety Fund of North America, a labor-management organization dedicated improving safety and health and reducing workplace hazards. Also, in 1988, LIUNA began offering its own leadership program for rank and file members. LECET was founded in 1989 and went on to adopt a mission of helping signatory contractors win jobs and create jobs for LIUNA members. And in 1989, Local Unions established a pilot Membership Assistance Program (MAP) in the Baltimore-Washington area, also giving members access to drug and alcohol rehabilitation programs. MAPs have since expanded to LIUNA Locals across North America, as these efforts not only improve the health and even save the lives of individual members—they also help avert workplace accidents, prevent employee absences and improve productivity. In 1994, the U.S. Department of Labor recognized the Construction Craft Laborer as an apprenticeable trade, opening the door for apprenticeship programs to begin throughout the union. The first Demolition and Decommissioning (D&D) Agreement in the nation was reached in 1999 at the Maine Yankee Nuclear Power Plant where northern New England Laborers were on the job with the necessary training required to dismantle one of the country’s largest nuclear power facilities. Soon after, a D&D agreement would be reached at the Connecticut Yankee Nuclear Power Plant for Connecticut Laborers’, decommissioning and dismantling another one of the country’s major nuclear power plants. In 1994, LIUNA General President Arthur Coia established a new organizing department and set up a new program called VOICE - Volunteer Organizing in Community Empowerment - to educate rank and file members on organizing and worker issues. In 1996, more than 2,000 asbestos workers and 1,500 demolition workers, struggling for safer jobsites and family-supporting pay and benefits, organized with the Laborers’ Mason Tenders in New York City. The landmark campaign helped union workers capture 75 percent of the interior demolition market in New York. In 1998, the LIUNA Public Employee Department was created and helped 5,200 workers with Riverside County, California, organize a union. In 1999, LIUNA formed the National Retirees’ Council to mobilize members after their working career ends and to benefit from their knowledge, skill and energy in organizing, political action and grassroots lobbying. Encyclopedia of U.S. Labor and Working-class History, Volume 1. Edited by Eric Arnesen. 2007. LIUNA History 1903 – 2003. Mike Matejka, Great Plains Laborers’ District Council. 2013. LIUNA New England Region. Download April 2014. Minnesota LECET Newsletter. December 2013. Edited by Dwight Engen.